Is Meebo moving into email? The web-based chat service already centralizes instant messages from AIM, Yahoo, MSN, Google Talk, Facebook, MySpace, and more. Folding in emails from different accounts across the Web is a logical next step. 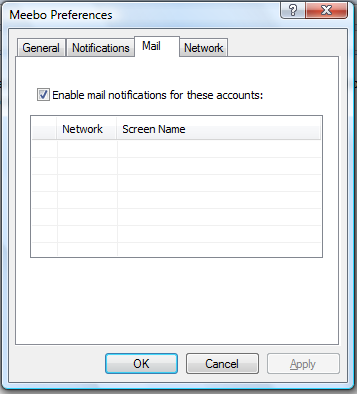 In fact, Meebo already tiptoed into the email arena this morning with a new feature which appeared in its Windows desktop notifier. A new “Mail” tab can now be found in preferences, allowing Meebo users to “Enable mail notifications for these accounts:” It then lists the IM accounts you’ve already signed up for on Meebo (which makes sense, since generally you use the same username and password for your email as you do for your IM within any given service such as Yahoo or Gmail/Gtalk or Facebook). When you get a new email, you get a notification pop up at the bottom of your computer screen, just like you do for new IMs. When you click on the notification, it takes you to the underlying email service. That does leave room for a “non-standard” email client. Certainly, adding email notifications that pop up like IM’s and then take you to your Web-based email service of choice would be just as much a convenience for Web-based users as for desktop users. But there is another clue pointing to somethingbigger than that brewing at Meebo. Every employee’s email address has been switched from employee@meebo.com to employee@meebo-inc.com. A switch like this is often a precursor to the launch of a Webmail product. MySpace recently did the same thing, as did Yahoo back in 1997 before it launched Yahoo mail. What would a Meebo mail product look like? It would have to take a backseat to IM, but you still need a place to send messages when a recipient is not online. Maybe the future of email is as a backup repository for IMs when you are offline. 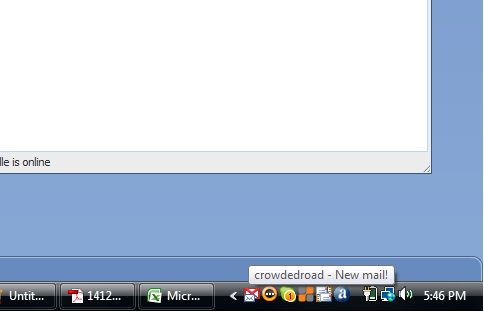 (Hat tip to the folks at Crowded Road for noticing the new notifier feature. Check out their Offline TechCrunch Reader iPhone app—iTunes link).